There was a time when this show would have cost you two dollars to see at The Bar Next Door, but times have changed. In the case of Jah Roots singer Josh Heinrichs and Woodbelly (from Arlington, Texas) vocalist Cas Haley, those changes have been for the better. 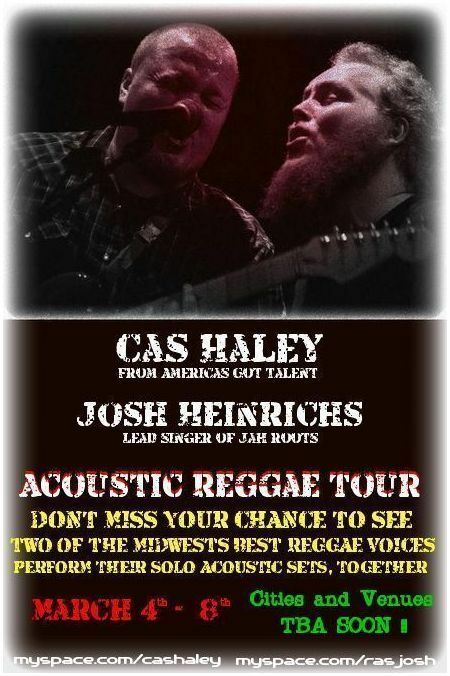 Heinrichs and the rest of the Jah Roots crew have gained enormous exposure performing at events such as Schwagstock, South by Southwest and Wakarusa; Haley rolled the dice on an appearance on America’s Got Talent that sent him to the show’s final round and led to his band now being known as Cas Haley and Woodbelly. Now the old touring buddies are getting together for a fresh set of dates, currently set for March 4–8. According to Heinrichs’s MySpace page, two venues are confirmed so far: March 6 at Murphy’s Lounge in Omaha, Nebraska and the Broadway Oyster Bar in St. Louis, Missouri on March 8. We’re holding out hope that there’s a Springfield date in the works, as well. Click the link for a couple of reasons why. This entry was posted on December 23, 2008 at 3:50 pm and is filed under Looking Ahead, News, Shows. You can follow any responses to this entry through the RSS 2.0 feed. You can leave a response, or trackback from your own site.